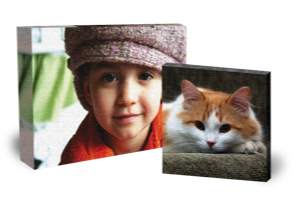 You can choose either a gallery wrap, black, or white border on the side of your canvas print. Gallery wrap is where the image wraps around the side of the 1.5" inch deep wooden stretcher frame. The outside 1.5" of the photo is copied and then flipped around the edge of the frame. Gallery wrap works best on images with scenery. Alternatively, you can select either a solid black or white border. This is recommend with tightly cropped portraits.